There were 50,345 fans in attendance at Aloha Stadium in Honolulu for the AFC-NFC Pro Bowl on February 3, 1991, where the game was being held for the 12th consecutive year. Coaches were Art Shell of the Raiders for the AFC and San Francisco’s George Seifert for the NFC. The AFC had the game’s first possession and went 71 yards in eight plays. QB Warren Moon of the Oilers completed a pass to Buffalo WR Andre Reed that covered 38 yards to the NFC 30. A 17-yard run by RB Thurman Thomas of the Bills got the ball to the 13 before the drive stalled and Kansas City’s Nick Lowery kicked a 26-yard field goal. Later in the period, and following an exchange of punts, the NFC had an opportunity to tie the score on a series highlighted by a pass from Philadelphia QB Randall Cunningham to his Eagles teammate, TE Keith Jackson, who then lateraled to RB Earnest Byner of the Redskins for a total pickup of 59 yards. However, the Nationals came up empty when Morten Andersen of the Saints missed a 40-yard field goal attempt. Following a long AFC series that extended into the second quarter, Lowery also missed a field goal, from 28 yards. The NFC responded with a long drive of 80 yards in 17 plays. QB Jim Everett of the Rams, an injury replacement for San Francisco’s Joe Montana, completed all six of his passes and rookie RB Johnny Johnson of the Cardinals dove into the end zone from a yard out with 43 seconds left on the clock before halftime. Andersen added the point after and the NFC led by 7-3 at the intermission. In the third quarter, the NFC had the ball first and put together another promising series. 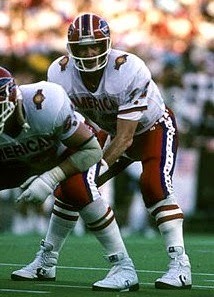 Cunningham, again at quarterback, completed passes to RB Barry Sanders of the Lions for five and 19 yards and 28 yards to Jackson to reach the AFC 15. However, two of the next three plays resulted in sacks and a 48-yard field goal attempt by Andersen was blocked by Buffalo DE Bruce Smith, who had also recorded one of the sacks. The AFC responded by driving 36 yards in eight plays to a 43-yard field goal by Lowery that narrowed the NFC’s margin to 7-6. Late in the third quarter, and following another exchange of punts, San Francisco WR Jerry Rice caught a pass that was nearly intercepted by CB Rod Woodson of the Steelers and gained 49 yards to the AFC nine yard line. From there, Johnson ran for his second TD and, with the successful extra point by Andersen, the NFC was ahead by 14-6 heading into the final quarter. Buffalo QB Jim Kelly (pictured at top) threw to WR Anthony Miller of the Chargers for 33 yards on the last play of the third quarter, and as the contest moved into the final period, he combined with other Bills teammates to advance the AFC to another score. Following three straight tosses to Thomas that totaled 20 yards, Kelly completed a 20-yard touchdown pass to Reed, threading the ball between two defenders. Lowery converted and the AFC was down by only a point. Everett came out throwing for the NFC on the next possession. He connected on three passes to WR Gary Clark of the Redskins, the longest for 19 yards, and Sanders ran for a 22-yard touchdown to cap the 80-yard, 11-play series. Andersen kicked the point after and, with 5:11 to go, the NFC was leading by 21-13. The AFC came back with another scoring drive, with the big play a pass from Kelly to Cincinnati RB James Brooks that covered 49 yards. Lowery kicked a 34-yard field goal to narrow the margin to 21-16. The NFC went three-and-out and had to punt. With just over two minutes remaining to play, Kelly threw to TE Ferrell Edmunds of the Dolphins for 27 yards and, two plays later, he completed a 13-yard pass to WR Ernest Givins of the Oilers for a touchdown with the clock down to 1:49. Lowery added the extra point to make it a two-point lead for the AFC. The NFC still had a chance to win and Everett tossed a third-and-18 pass to TE Steve Jordan that gained 29 yards to get into field goal position. However, Andersen’s 46-yard try with seven seconds on the clock was blocked by Miami DE Jeff Cross to preserve the 23-21 win for the AFC. The NFC finished with a slight edge in total yards (368 to 358), with both teams gaining 90 yards on the ground, and also had more first downs (22 to 17). There were no turnovers. Jim Kelly, who was named the game’s MVP, completed 13 of 19 passes for 210 yards and two touchdowns while Warren Moon was 6 of 11 for 72 yards. Thurman Thomas led the AFC with 38 rushing yards on 7 carries and had four catches for 36 yards. James Brooks was right behind in the ground-gaining department with 36 yards on five attempts and Andre Reed also had four pass receptions, gaining 80 yards and scoring a TD. 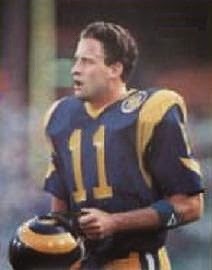 For the NFC, Jim Everett (pictured at left) was successful on 13 of 18 throws for 138 yards and Randall Cunningham went to the air 11 times, completing 6 for 168 yards. Barry Sanders rushed for 35 yards on 7 attempts and Johnny Johnson gained 32 yards on 10 carries that included the two TDs. Gary Clark caught 6 passes for 65 yards and Jerry Rice gained 62 yards on his three receptions. Morten Andersen had a rough day, having two field goal attempts blocked and missing another from 40 yards. “Man, I’m glad the kick went our way today,” said Jim Kelly, referencing his team’s one-point loss in the Super Bowl the previous week against the Giants when Scott Norwood missed a potential game-winning field goal at the end. The win for the AFC was the first in three years and cut the NFC’s advantage to 12-9 since the all-star contest had switched to the AFC vs. NFC format.